Social network I and II are two soft sculptures made out of hand knitted, see through monofilament. It’s actually fishing line! It was fascinating to knit with technically, and also aesthetically. There is an interesting change in control as the monofilament is very hard to knit with. It has to be controlled in different ways to knitting with wool, yet once it’s knitted, certain qualities of the plastic makes it take on a different form, like a spontaneous drawing in space. It has a mind of its own! The almost transparent line is also transformed, as it’s knitted, into something ‘other’, ethereal and sparkling. 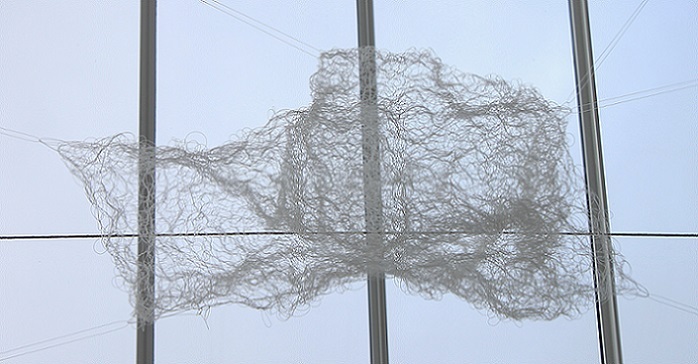 Both pieces were knitted on large circular needles as tubes of knitting, but when they’re installed the stretchy structure of the knitting enables them to be sculpted into many different forms using tension. 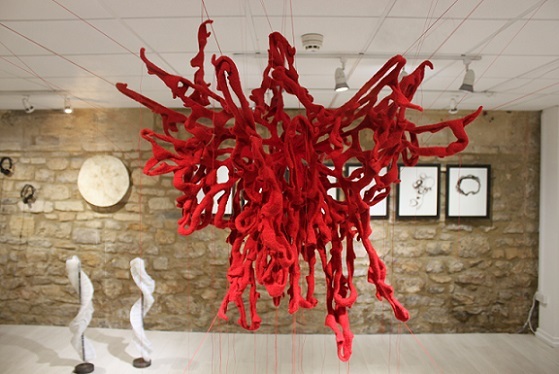 All the babies I might have had I is a red hand knitted and felted soft sculpture which resembles a web. To date it has been installed five times by suspending it; it relies on gravity and tension to transform it into a sculptural piece. However, when it is not suspended it still has some sculptural form. The reference to ‘tension’ when applied to knitting is apposite! 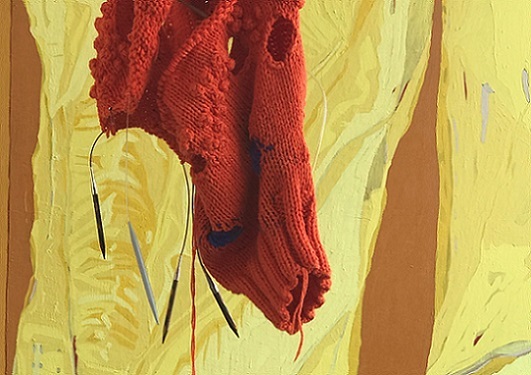 I knitted it as part of my final piece for my Art Foundation course in 2011, when I began to understand that it was possible to make conceptual art with knitting. It was a revelation, and very liberating. I knitted it in pure wool, knitting a series of holes radiating out from the centre. I used double pointed needles and hundreds of safety pins as stitch holders. I was truly ambivalent about felting it as it was fabulous as a knitted piece, and obviously also much larger. However, at that point, I decided I wanted my work to be less recognisable as knitting, and more sculptural, so I felted it. I am so glad I did as it became something ‘other’.